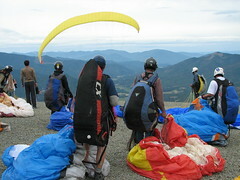 Last year, twelve Hawaii pilots enjoyed what was for most of us our first competition at the Rat Race in Oregon. This year the organizers are doing it again, and they are also hosting the Nationals the week afterwards in Lakeview, Oregon. I am considering signing up for both - Dorothy gave me the green light to try and make it work. I encourage any of our P3+ pilots who want to put their thermal and XC flying on a fast track to consider signing up. Or if you are feeling more mellow you could also just consider coming along as a volunteer to help the organizers (like Reaper is planning on doing): you can see what a comp is all about, do some casual flying, and meet a lot of really great people who seriously know how to fly. See you there! if you're "thinking" about it, you should sign up NOW, because there are only 130 candidates! Dangler Greg said he's signing up for the Rat Race. Jetflap is considering signing up for the Rat Race as well. I've signed-up for the Rat Race: This year . . . I WILL make goal on at least one day!!!!! I cannot afford to also do the Nationals: one or the other. I think I will volunteer to do retreival at the nationals. I heard Frank and Scrappy are signed up too! Yay! 10 of us are signed up for the Rat Race and 4 for the Nats. Sandy, Alex, Bob, Frank, Greg, Jetflap, Quentin, Ray, Scrappy, and Suicide signed up for the Rat Race. And Don is coming to watch. Reaper is going as a volunteer, and Motorhead Paul and Seattle Ray may also be there. Alex, Bob, Dave, and Quentin are signed up for the Nationals. Don may come and watch that one too. Reaper is volunteering. But what about Ray? Come on, dude! If you can make it we'll have the entire HPA board of directors flying at Lakeview! hey alex. i am totally in for volunteering for the rat race. i will be in oregon during then. fun fun! Any input from the experienced on whether it is a help or hinderance if the girlfriend shows for the weekend? I am thinking about camping. last year it was fun and I think it will be again! Paul and Reaper can put together a great and confortable set up! return ATA 4517 leave OAK sun 1 8:30pm arrive HNL 10:50pm. car rental from dollar for this period would cost $276 for a dodge caliber. any takers to fly the same flights and share the car??? it is official: I am registered in the nationals!